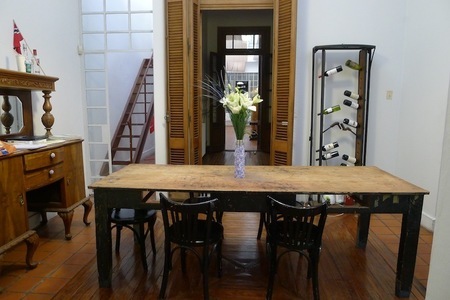 This unique, oversized studio with full kitchen, full bath and it's own sun deck is located in the heart of Recoleta, one of the most elegant and exclusive districts in Buenos Aires, where you can find shops, restaurants, nightclubs, bookstores and practically anything you can think of within walking distance. Despite being close to the action, this apartment stands on the first floor (one floor up, not ground level) facing to the back of the building, so you won't hear any of it. Although it's technically a studio, the bedroom (queen size bed) is separated by a wall from the kitchen and living areas for added privacy. 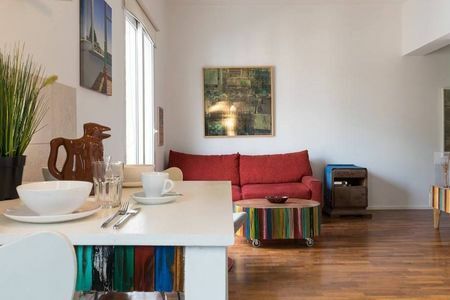 The apartment has a full kitchen with gas oven and stove and full-size fridge, equipped with all the essentials to cook a meal if you wish. 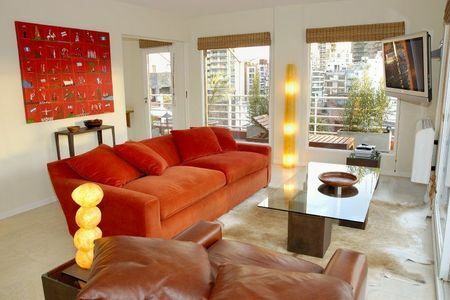 Dining area has a square table that sits 4-6 comfortably (very comfortable to work as well), and the living area offers a soft couch to lay back and rest or listen to music after intensive shopping or working. But what gives this place it's particular charm is the gorgeous, recently renovated sundeck with two lounge chairs, perfect for daytime sunbathing or night-time relaxing in Spring and Summer. 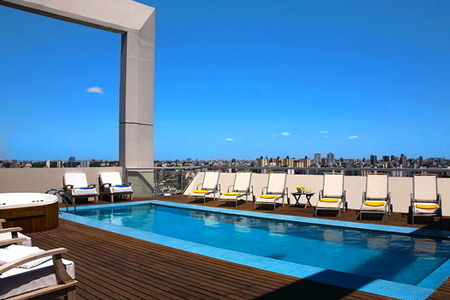 On those hot Buenos Aires summer days, you can enjoy the terrace mini-swimming pool while you get a nice view of the city. 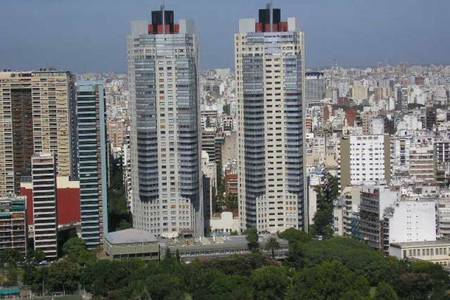 You can even make your own barbeque in the terrace recreation room, equipped with an Argentinean "parrilla" (grill). The entrance door is activated by a coded security card, and there are security cameras in the lobby as well. 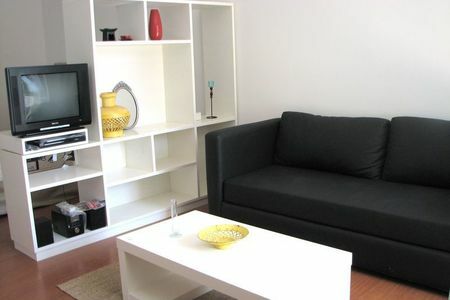 This is a fantastic, cozy apartment for short or long-term stays, as it really feels like a home away from home. Check-in is from 2pm to 8pm and check-out is from 8 am to 11 am. 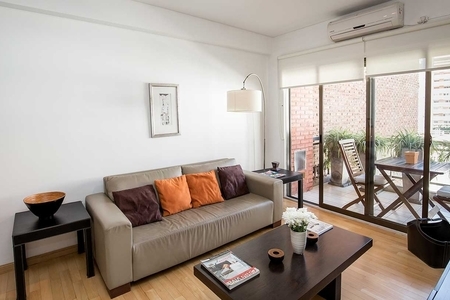 Late check-outs or early check-ins have an additional cost of USD 25 and they are subject to the apartment not being reserved that same day. Upon arrival you will need to present a photocopy of the first page of your passport/travel document and sign a lease contract and inventory. 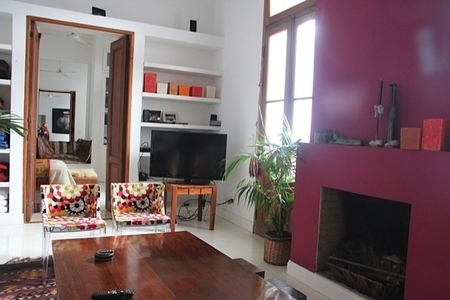 Included in the rate: occupancy, broadband internet with wifi, cable television, towels and linen, use of pool (in summer). Landline phone is free for incoming calls and works with calling cards available in any convenience store around for outgoing calls (the instructions are inside the apartment). Clean-up: rate includes clean-up upon departure. 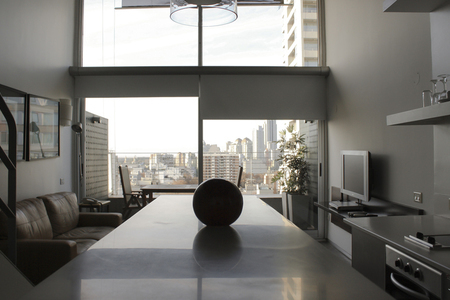 For stays longer than one week, a weekly clean-up and linen-towel change is included as well. Should you want more, you can deal directly with the maid. 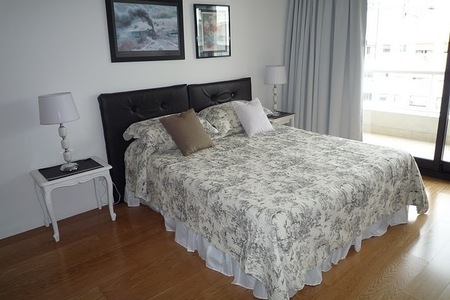 Furnishings include: safety deposit box, internet wifi router, landline phone, individual heating system, air conditioning, cable television, full kitchen with utensils, music centre, flatware and dinnerware for four, ironing board and iron and hairdryer. People rave about this place and many guests come back over and over again!